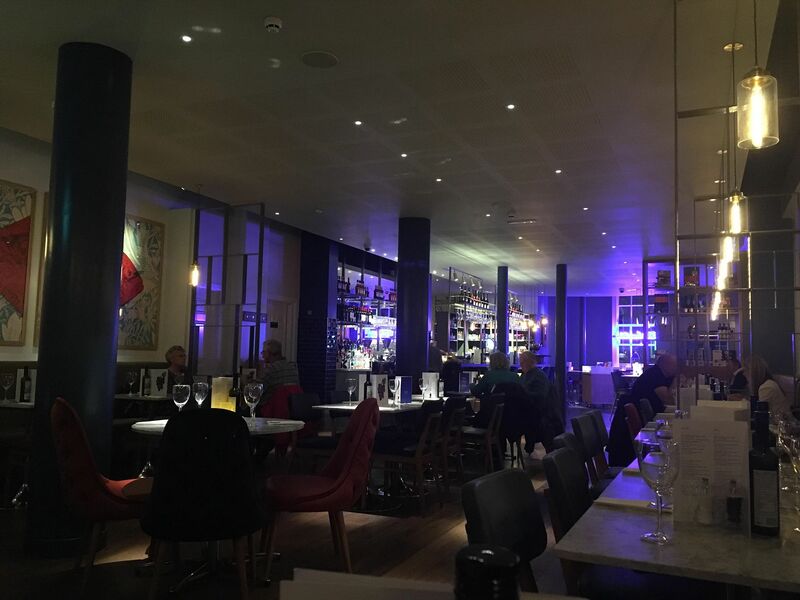 It’s a while since we’ve reviewed some places to eat in the North East, so our blogger PAUL WHITE sets out to put that right with a visit to the newly refurbished Carluccio’s in Newcastle. I’ve been to a couple of Carluccio’s Restaurants, but never the one in Newcastle. So, when I received an invitation to try out the newly-refurbished restaurant on the city’s Grey Street, I jumped at the chance. I’ve reviewed everything from music to beer, but never a restaurant, so it was new territory for me. And, somewhere around the main course, I realised that, being a few weeks into a City & Guilds Level 2 in cookery, I’m probably more qualified than Greg Wallace to review a restaurant, anyway. The restaurant has had a make-over, the deli counter replaced to focus upon the restaurant experience. New lighting, new marble tables, Mediterranean style pictures on the wall. It’s all very stylish. And the welcome was very warm. Manu, our waiter, was very attentive, allowed us a choice of seats, explained the menu – including additions, subtractions, alternatives- very well, patiently answering questions throughout. Queries about sauces weren’t simply responded to with a list of ingredients, but the method and style of cooking was explained, too. We also met the Assistant Manager, Maria, who ensured all was ok. Pleasingly we saw all the other diners receiving similar attentions. So, on to the food. There was a good range of starters. My normal favourite, calamari, wasn’t available on this occasion, driving me to a choice of prawns marinara (with white wine, tomato, chilli and fennel sauce) or Sicilian arancini (on ball mozzarella, the other beef ragu). I went for the arancini. My wife went for the prawns. 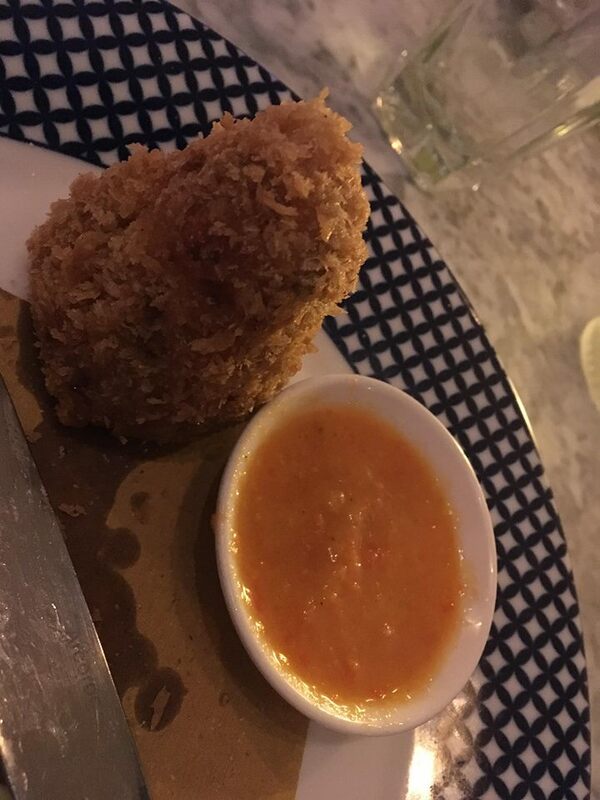 It looked so appetising, I forgot to take a picture of the arancini as a whole, but I can tell you it was up to the standards one would expect from a high-end chain like Carluccio’s. The pepper-based dip was a good accompaniment, not too overpowering. While the mozzarella ball was a great start, the beef ragu ball was well seasoned and a great complement. While the prawns were very spicy, my wife tells me they were hot without overpowering and killing the other flavours, particularly the sweet tasting tomatoes. After a suitable pause in proceedings, the mains arrived. I had been spoiled for choice. 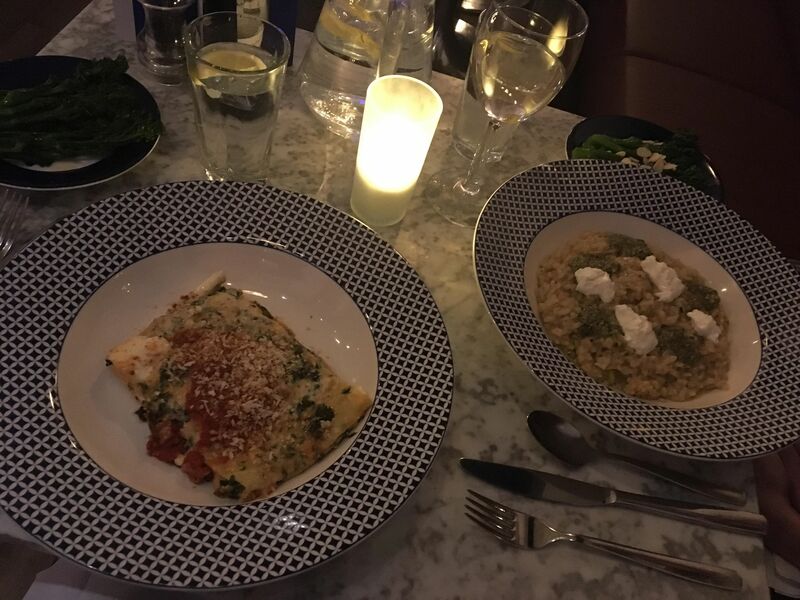 The crab and lobster lasagne special sounded like a sure thing, until I looked at the regular menu and spotted pork saltimbocca, veal ossobuco, sea bass and lobster tagliolini. I think I’d have been happy if only one of those had been an option. There were lots of vegetarian and vegan options, too. I went for the special, conscious that it could so easily be a bad choice, if not done correctly. 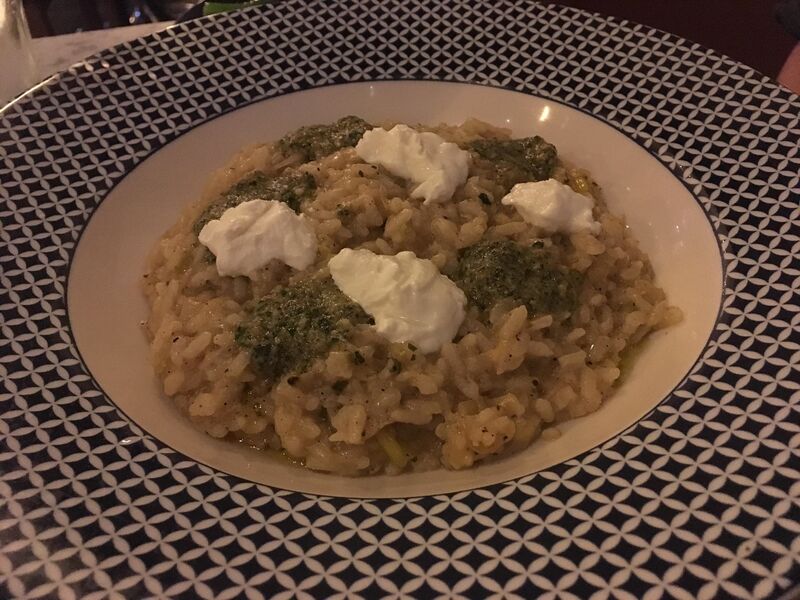 As a side, I opted for the garlic and chilli broccoli, as did my wife, who went for the special risotto, with leek, pesto and ricotta (“a good vegetarian alternative to the usual mushroom”, she tells me). My main had very delicate flavours, extremely tasty and the chef had done a great job of balancing the ingredients so that no one overpowered the others. I was worried the side would be too much, but it was definitely more garlic than chilli and reminded me very much of the garlic broccoli we were served on visits to Beijing. The main and side complemented each other pretty well and I found myself mixing between eating together or separate, enjoying the flavours of both. The broccoli – a tad al denté – was the star and as good as we’ve had anywhere since our China visits. The portion size was pretty much bang on, too. I felt myself slowing towards the end, mindful that no reviewer worth his salt would be too full for desert. My wife’s risotto was well cooked, but perhaps a larger portion than was manageable in a three course meal, yet still great “comfort food, winter fayre”. 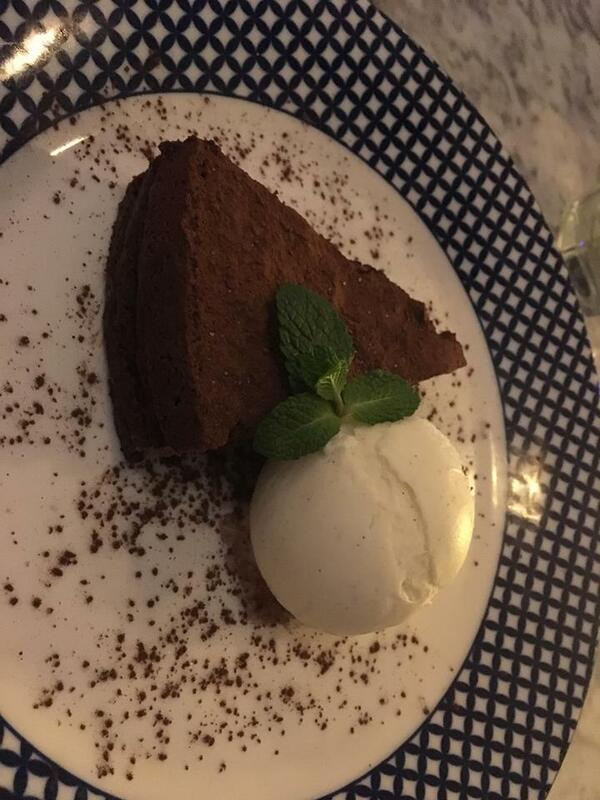 For desert, I opted for the torta di cioccolata. 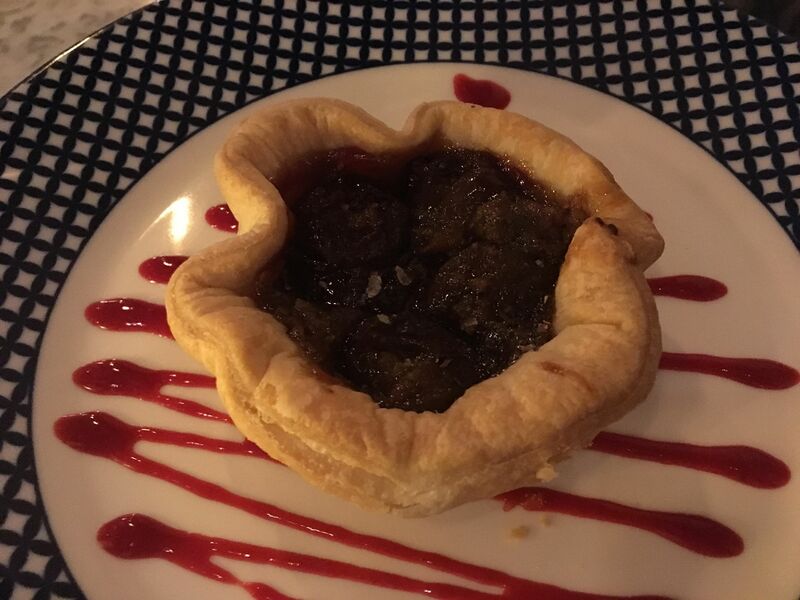 My wife went for the plum tart, the menu writers having lost their translator by this point. The chocolate tart was a risk, considering the fact I was close to full, but I needn’t have worried. Served with vanilla ice cream, the combination simply melted in the mouth; a surprise after the tart had proved quite robust when using my spoon to cut a piece. The plum tart was was a nice, light contrast to what was a heavy main. So, what about the drinks. As I was driving and had had a pre-meal beer at the nearby Lady Grey’s, I stuck with good old tap water, a touch envious of those who could enjoy a Peroni Gran Reserva (always nice to see a restaurant give that more malty alternative to the standard Nastro Azzurro). My wife, who knows a good wine when she drinks it, enjoyed a glass of the house white, a Sicilian Sicani Bianco. The word “quaffable” was used. My one disappointment? I’d always thought a food critic should be just that, critical, picky. Carluccio’s fans, and those of good Mediterranean food in general, won’t be disappointed. What’s your favourite Italian restaurant in Newcastle or the North East? We’d love to hear your comments below.